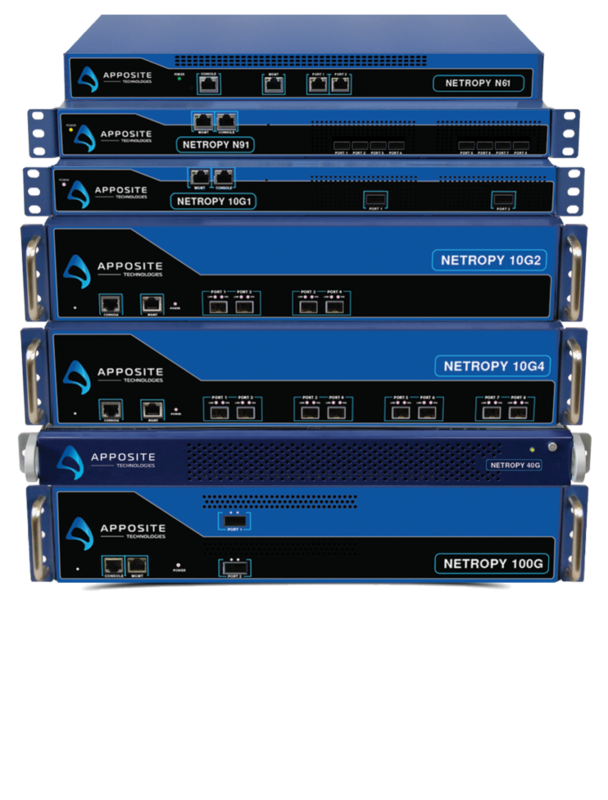 Emulating networks with Apposite’s feature-rich Netropy network emulator lets you quickly benchmark, troubleshoot, and optimize performance testing of your mission-critical applications under the most challenging conditions. Netropy’s high-performance testing lets users emulate even the most complex networks. Simulate up to 15 separate links on each pair of ports and individually control for impairments, such as bandwidth constraints, latency, jitter, and loss at speeds up to 100 Gpbs. Import live traffic, vary impairments, emulate network latency, and measure their impact in real time. Netropy network emulators are quick to install, intuitive to configure, and easy to operate. The Netropy GUI provides the responsiveness of an application with the convenience of a standard web browser. Get up and running in minutes with no training necessary. Multiple Links: Simulate up to 15 separate WAN links through each Emulation Engine. Multiple Engines: Take advantage of multiple emulation engines with the Netropy N91, 10G2 and 10G4 models which provide concurrent testing capabilities for multi-user environments. Packet Filtering: Assign packets to different links by IP address, VLAN, or any other packet identifier. Bandwidths up to 100 Gbps: Precisely emulate links from 100 bits per second up to 100 Gbps. Latency up to 20 sec: Emulate delay and jitter of 10 seconds or more in each direction, in increments of 0.01 ms. Flexible Interfaces: The N61 and N91 emulators are available with copper or SFP ports. The 10G1 and 10G2 offer 1/10 Gbps dual rate SFP+ ports for easy integration into 1 or 10 Gbps networks. Loss & Corruption: Set random, burst, or periodic packet loss. Test the effects of corruption on voice and video applications. Capture & Replay: Record the delay and loss characteristics of a production network as they vary second-by-second and replay them through the Netropy network emulator. Background Utilization: Test application performance over a congested network with Netropy’s background utilization and PCAP replay features. No need for costly traffic generators or a rack full of client machines. Traffic Monitor: View and download up to 24 hours of throughput graphs and link statistics. Automated Testing: Automate application performance testing with Apposite’s comprehensive command line interface (CLI). Unsurpassed Precision: Test with confidence with Netropy’s high-precision WAN emulation tools to ensure accurate and repeatable results. Priced Right: Get the functionality and performance you need at a price you can afford. Multiple Engines: Take advantage of multiple emulation engines with the Netropy N91, 10G2 and 10G4 models which provide concurrent testing capabilities or multi-user environments.